My mailbox had freebies this week. Sometimes the free samples and item I request show up in a week, others are months down the road. However, because I request free items often, I have a pleasant surprises waiting in my mailbox! Each Sunday watch for the “week in review” ~ it is a list of the available freebies from the week. Are you beginning to get free items in your mailbox from requesting samples? Leave a YES in the comments! I’d love to know you are getting the free things! Pt 1. SIGNING UP FOR SAMPLES: IS IT WORTH IT? YES!! YES! And yes! Did I say yes? It IS worth it! I have heard many comments reasoning why it’s not worth signing up for samples. Comments range from “It’s not worth my time” to “Seriously, why? It’s not for products I want or use”. Recently, in my mailbox was a ‘beauty bag’ which included $25 in coupons, 5 samples and the bag was a darling fabric zipper bag that has many uses. It was worth it. There are many reasons to sign up, here’s a few. • signing up gives something to do with all the extra hours in the day~~JUST KIDDING! Samples are not necessarily small; many times I receive full size products. Sample really means “try me free”! Categories of products you’ll find samples in for food, laundry, cleaning, personal hygiene, paper, plastics, pain relievers, drinks, cosmetics, office supplies, even full year magazine subscriptions (great for gifts)! Here is list of items I have personally received. None of them paid for by me, I promise you! The ones I have underlined were full size products; cereal, Poptarts, nuts, oatmeal, gum, cereal bars, energy bars, mayonnaise, mustard, Bisquick, popcorn, pancake mix, single serve desserts, fruit snacks, juice drinks, coffee creamers, sweeteners, tea, coffee, reusable tote bags, sunscreen, potholder, laundry detergent, fabric softener sheet, fabric softener liquid, feminine products, Ziploc bags, trash bags, toilet paper, wet wipes, bar soaps, razors, shampoo, conditioner, Aveda lotion, floss, toothpaste, diapers, formula, kids vitamin gummies, perfumes, pet treats, pet food, cosmetics, energy drinks, fiber, post-it notes, Avery labels, pain relief patches, ear plugs, sleep aids, flu remedy, plant seeds. There are SO many more!! So, yes, it is worth signing up for samples. I encourage you to begin signing up. Coming soon, Pt 2. OH SAMPLES, WHERE ARE YOU? Finding good samples. Pt 2. OH SAMPLES, WHERE ARE YOU? I shared with you the value of samples in Part 1 HERE. Now, where are all the samples found and how do you go about receiving them? Everyday companies are looking to promote upcoming product or to highlight current products in hopes of gaining new customers. They believe if they can get people to try it, they will like it and continue to purchase the product. Samples provide the companies market research information. A 30-second commercial on TV can cost $400,000+ vs. sending a sample to 100,000 consumers for under $1/each. The consumer is actually trying a product instead of the advertiser hoping you buy it and try it! Samples are cost effective advertising. Where are they? Come to tipresource.com and I will keep you up-to-date with many samples. Other places to watch are corporate websites or individual product websites. If you favor a particular brand, visit their Facebook page. 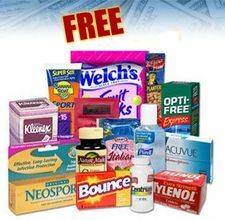 Many free samples, including full size products, are offered when you “like” them. Some are offered at a specific date & time and quantities are gobbled up quickly. Specifics are usually posted on their Facebook Wall or product website. Sample offers are found in magazine ads and inserts. Some offers are even mailed to your home. Printable freebies from some manufactures are redeemable by presenting the printed offer to the local store. I’ve see this with beauty products i.e. Aveda. Writers and publishers looking to gain your interest offer free ebooks & Kindle books. Look for hangtags on grocery items or mail-in offers on tearpads found near products of the same brand. Mommy samples offers Formula & diaper come in new-baby hospital gift bags. Sometimes, the offer is on a products packaging or a flier inserted into a product. Join community panels, such as Kraft First Taste and Vocal Point. Members are offered free samples or full size products with the hopes of you sharing your comments with them & your friends. Some surveys reward you by sending you a sample upon completion of a survey. So, to answer the burning question “Oh samples, where are you?” …..it is just a matter of keeping your eyes open. 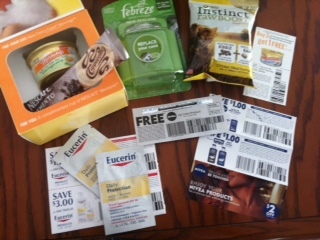 Samples & Freebies From My Mailbox This Week. I am highlighting samples in a 4 part series HERE. For me, I see value in the few seconds it takes to sign up for free samples of products I can use, am curious to try or use for donation. Hope you enjoy a glimpse into the type of items I receive in the mail for free! If you are in Las Vegas and want to come to the free couponing information class, email me and I’ll send you the details. Pt. 3 Sign-up for samples, 3 make-it-easy tips & resources. I covered “Why sign-up for samples?” in Part one: “Where are the samples?” in Part two. Now, in Part Three: make-it-easy with time saving Tips & Resources. I spend less than 5 minutes a week signing up for free offers. ~Choose a short easy to type name. Keep it simple. You will enter this email address often. ~No overlooking email confirmations for the sample. When I have a moment, I pop on my samples email and quickly clean up any junk mail, confirm any necessary sample confirmations, and glance through the newsletters I requested. If the emails start piling up, simply delete the email account and start a new one. Tip: If you are a new mommy, get a different email account for “all things mommy related” keeping your resources in one organized place. Tip 2. Get a just-for-samples facebook account. ~keeps your personal facebook page cleaner. Tip 3. Get an auto-form filler. Personally, I use Roboforms Pro.~there is a free version on this link also! With 1-click fills and submits your name/address etc for you. It takes me seconds to click and auto-fill the form. I verify any codes and submit. On my auto-filler I have a family members name so when I see something she will like with 1-click I send it to her, too. Pt. 4 What to do with all the samples. This is the final installment of my 4 part Sample Series. We have covered, are they worth signing up for, where to find samples, how to sign up for samples with ease. Now, what will you do with all your samples? Here are my tips & resources for the samples. 9. Breakfast fun~I wait until I have many breakfast items to choose from, then bring them out one morning for the kids. They love it! 15. Friend stressed out? Fill a gift-basket of yummy samples & surprise her. 24. Make a new baby mini-gift basket, so the new mommy can try all different baby products & what she may want a large size of. 30. I keep a container with snack size samples for the kids to choose from at snack time. 41. Make a sleep-over kit with toiletries for kid. 43. Use high value pet food coupon freebies to buy food & deliver to no-kill shelters. What tips do you have for samples that come in the mail? Any extreme ideas? Share with us in the comments below.